Power resistors and resistance heaters share many common design considerations. In both products, good thermal design ensures low thermal resistance between the element and the exterior environment. Both must be rugged and reliable. Power resistors are often used in heater applications. They allow a designer to apply and control heat to a small area. Riedon offers a broad range of these resistors. If one of our standard resistors won't do we can modify existing products or create new designs to fit your special requirements. 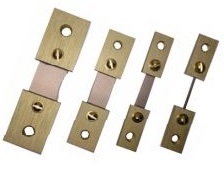 Riedon power resistors are used in a variety of heater applications. They are especially useful in situations where the heat must be isolated or concentrated in a small area. For example, Riedon power resistors are used to eliminate condensation on outdoor security camera installations. Heat from the resistor keeps the lens temperature above the dew point. With small "footprint" resistors, heat is localized to optimize energy-efficiency of the system. Another application uses our resistors to warm and control the temperature of samples in blood analyzer systems. In electronic circuits, power resistors provide heat to sensitive semiconductor chips and circuit boards protecting them from damage by condensation and cold conditions. In life science applications, localized heaters are used to incubate bacterial cultures providing tight temperature control with minimum over-shoot and no out-gassing. Some analyzer systems use resistors to heat test samples. Power resistors and heaters share a common critical design requirement - efficient thermal design. In either product, good thermal design provides low thermal resistance between the element and the exterior environment. Power resistors must dissipate the heat generated by current flow through the resistance element. This heat must be removed from the resistance element and transferred to the surrounding environment. The efficiency of this process is critical. Resistors in contemporary applications must be small and reliable. If the thermal design is not efficient, the resistor is unnecessarily large for a given power rating. Reliability is poor because the element will operate at a higher temperature. Thermal efficiency for heaters must also be high. Poor thermal efficiency will result in excessive energy consumption, and the reliability will be compromised because the element must operate at higher temperatures. Efficient heat transfer also improves response time facilitating better temperature control and minimizing thermal hysteresis and overshoot. Contemporary electronic and electrical equipment design places importance on size and efficiency, so modern power resistors must be small. As an example, Riedon's TF1220S film power resistor is rated at 25 watts and has a mounting "footprint" of only 0.21 in2. As a heater, this translates to a power density of 119 watt/in2! With a thermal resistance rating of only 3.0°C/W, it's thermal efficiency is very high. Other Riedon power resistors have watt-density ratings from below 10 watts/in2 to over 50 watts/in2 and surface areas generally below two square inches. Resistors are designed for ruggedness and reliability. These features are also important in heaters, but often ignored in standard heater designs. For high reliability, resistors (and heaters) must be electrically stable and structurally sound. Elements run cooler in low thermal resistance designs, lengthening life. Film elements are normally bonded to anodized substrates. Wire elements are wound on cores that are centerless ground for uniformity, preventing hot spots and ensuring uniform heat distribution. Resistance wire and leads are welded to stainless steel end caps, and elements are protected with molded epoxy cases or silicone coatings. Dielectric strength is typically 1000 VAC or higher. Riedon can modify existing power resistor designs to fit many special applications. For example, it is relatively easy to imbed one of our standard wire-wound power resistors into a custom case. This approach provides a low-cost alternative to special cast-in heater designs. Our custom capability is somewhat unique. Riedon focuses on small to moderate volume resistor requirements, as contrasted to the high volume "commodity" business. This allows our manufacturing system to easily accommodate customized designs and short run requirements while still providing a high level of customer service at economical prices. Prototypes are delivered quickly at minimal cost, and early production delivery is fast. We provide these same advantages for our resistance heater and RTD business segment customers.